The site where the city intends to build an underground sewage lift station and an above-ground building for electrical gear. Iron Works townhouses are at bottom right. Some Albany residents have become concerned about plans to build a sewer pump station on the Dave Clark Path near where they live in the Iron Works townhouses on Water Avenue. But the design is more than half done, and the city says changing it would cause delays and a significant increase in the cost. The city staff discussed the project with the council in July 2017, noting that it would require rerouting a short section of the path. 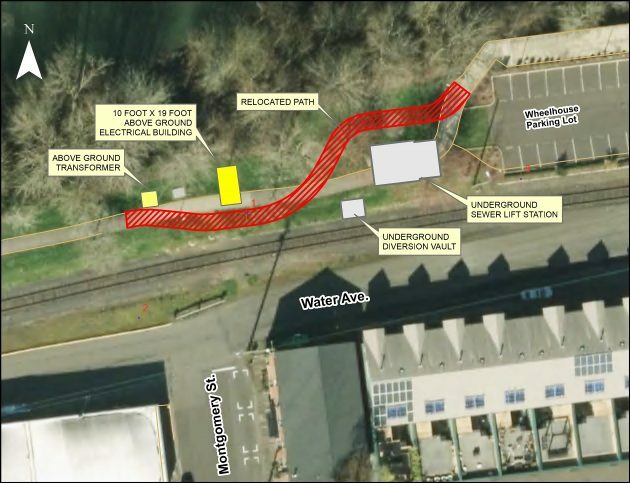 The pump or “lift” station is part of a big project to build a new sewer main along Water Avenue to take the load off the Riverfront Interceptor, Albany’s oldest and largest sewer main. The goal is to prevent overflows to the Willamette River during periods of heavy rain. The council discussed the project again on Feb. 28, 2018, when it approved borrowing $13 million from the state Department of Environmental Quality to pay for it. The loan is for 20 years at 1 percent annual interest with a “0.5 percent fee on remaining principal” (whatever that means), requiring an annual debt payment of about $750,000 starting in 2020. 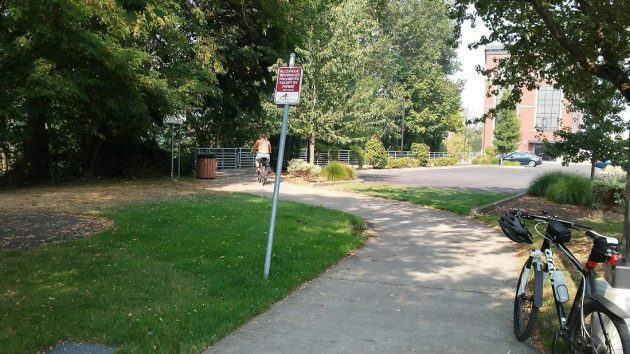 Albany hired West Yost Associates of Eugene to design the project, and City Engineer Staci Belcastro says the design now is about 60 percent complete. Construction is expected to begin late this spring or early summer. If there is one thing to worry about in Albany, this pump station sure as hell is not it. No concern worthy of an article here. Courtney Minyard, your concerns are more than a day late I’m afraid. Enact your neighborhood watch to keep the vagrants and taggers at bay and if looks are a concern, look the other way. Was sufficient due diligence practiced when these imperceptibly affected condo-owners considered purchasing their homes? Seems fundamental, particularly when the riverfront property in question is owned and/or managed by government agency. Was their any attempt to obfuscate the ugly realities of potential riverfront development by the original sellers of these condo units? All n good time, my pretty! Sure puts a “monkey wrench” into those spendy$$$ homes that Lake Oswego developer is trying to pedal along the riverbank. Nothing like a sewer station out in open with attendant later mechanical problems to really put a de-value in place. Albany still gonna forgo $40K on each completed unit??!! Too bad for Dave Clark that his namesake pathway will forever be a sewer path…… Maybe move his “name” say to the Periwinkle bike path. A more fitting tribute to his long time parks-n-rec efforts w/o the constant sewer, transient, trash problems with the present river front path.